Compare the Life smart 600DX to any major brand on the market and you will find that not only do our spas offer equal or better accessories and comfort, but we manufacture the most sturdy spa shells in the business. 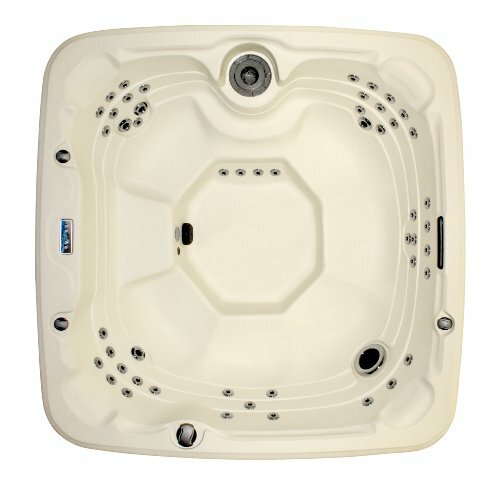 The Life smart 600DX has the same standard parts and features as any name brand hot tub – such as Balboa topside controls, adjustable high therapy jets and top-loading filters. We also feature our highly indestructible Rock-solid Shell. This state of the art rotational molded shell is virtually indestructible and will far outlast the standard acrylic spas Only Life smart uses Eco Smart technology, the highly efficient energy management system built into every spa. In fact our Spas are the only brand sold at Sears that exceeds the strict California Energy Mandate for spas and hot tubs. The 600DX Spa has wide open barrier-free seating complete with 65 full therapy rotating back jets, a waterfall and foot well jets. There is even a multi jet turbo blaster that produces the ultimate back massage. There are top-side comfort valves that allow you to find the perfect mix of air and water for the perfect massage. The 600DX also features a top-side digital command center and features a spa light with interchangeable mood lens caps. Add the Life smart 600DX to your backyard today and enjoy the luxury you deserve. Special Bonus: For a very limited time receive a Free upgraded Super Energy Saving Value Package This Includes Special 3″ Thick Tapered Locking Hard Cover, Full Foam Insulation, Ozone Water Treatment System, Upgraded Stainless Steel Jets and LED Color Lighting System at 1099 USD Value. For additional info please see the video and special PDF attachments on this web site.